Buenos días. Good morning. I am delighted to be here in Madrid, a charming world-class city with numerous historic monuments and elegant boulevards. I am deeply impressed by the rich history, art and culture here. While Spain and Hong Kong are geographically quite far apart, travel between Madrid and Hong Kong has become so handy after the launch of direct flights by Cathay Pacific Airways in June this year. This would help facilitate exchanges, both economically and culturally, between the two places. No doubt there is much scope for closer collaboration between the two economies. Last December, we welcomed the High Commissioner of the Ministry of Foreign Affairs and Cooperation, Mr Carlos Espinosa de Los Monteros, to Hong Kong for the Hong Kong Business of Design Week. 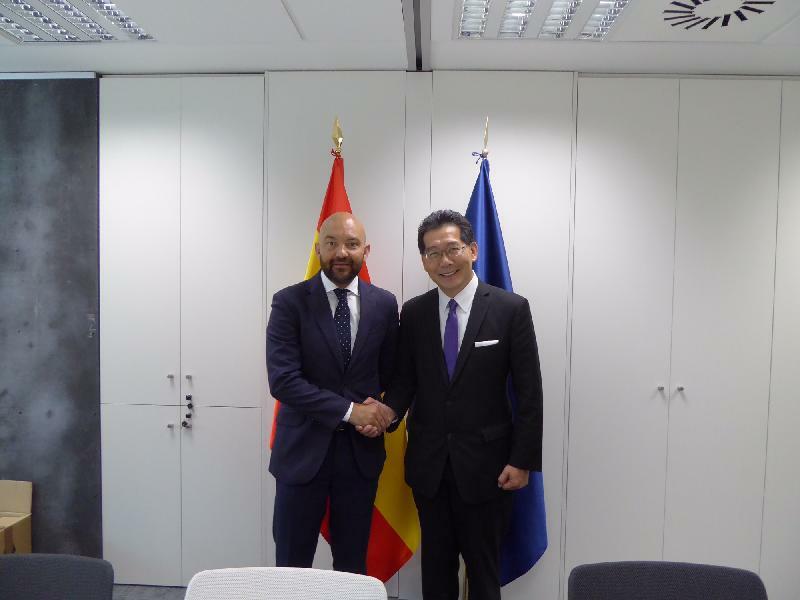 In the same month, we also welcomed Deputy Director General of the Ministry of Foreign Affairs Mr Fernando Alonso Navaridas to have a week-long sponsored visit to Hong Kong. And with the kind hospitality of the Spanish Government, I am now visiting the great capital of Spain. I do hope that with more exchanges of official visits and trade missions, both economies can foster closer ties and our enterprises can partner to venture into new markets. In fact, I am confident our co-operation will only expand in the coming years, thanks to the ambitious and visionary initiative of the Silk Road Economic Belt and the 21st Century Maritime Silk Road, commonly known as the Belt and Road Initiative, that was spearheaded by President Xi of China in 2013. Allow me, over the next few minutes, to share with you some of my thoughts on how Hong Kong can support Spanish business, and how we can help you capitalise on the wealth of opportunities emerging from the Belt and Road Initiative. Through the Belt and Road Initiative, we expect to see soaring investments in infrastructural facilities, deepening financial integration, expanding trade and the building of people-to-people bonds on a global scale. The Belt and Road Initiative covers various aspects and proposes co-operation in many sectors, but fundamentally the Initiative is about making connections. And I am proud to say that facilitating connections is also what Hong Kong is good at. This is how we see Hong Kong will contribute to, and benefit from, the Belt and Road blueprint. Hong Kong may play this facilitator role perfectly, thanks to the unique advantages presented by our "one country, two systems" arrangement. When you are in Hong Kong, you are in China - but a Special Administrative Region of China that provides the combined advantages of "one country" and "two systems". Hong Kong is an international gateway to Mainland China, offering unique physical and intangible connectivity to the Mainland with privileged trade and social access. On the other hand, Hong Kong has a well-established system that connects us to the international community in terms of our legal system, language, trade practices as well as lifestyle which international traders are familiar with. Consider, for example, CEPA (the Mainland and Hong Kong Closer Economic Partnership Arrangement), Hong Kong's free trade agreement with the Mainland of China. CEPA provides preferential treatment to Hong Kong service providers, regardless of nationality, as well as tariff-free treatment for products that have been conferred the Hong Kong origin. 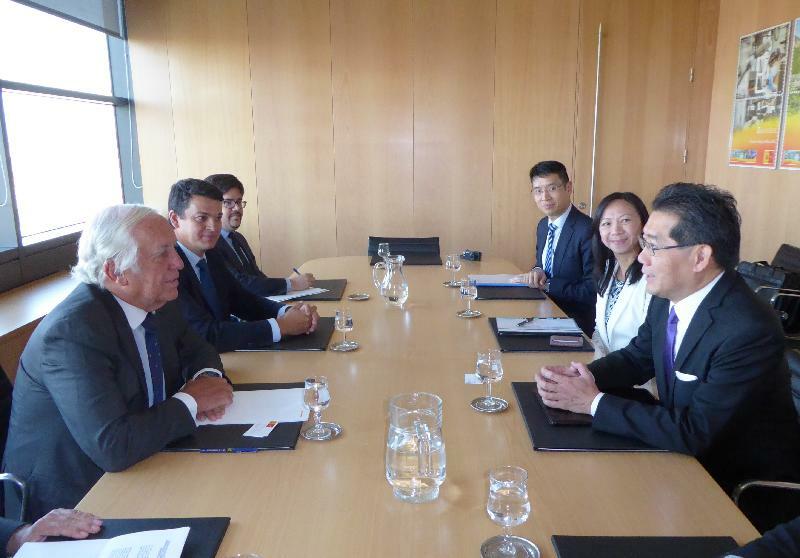 Working with Hong Kong, Spanish companies can gain the same access to the markets of the Mainland. It's your ticket to the massive Chinese consumer market and its fast-rising middle class. "One country, two systems" has made Hong Kong the "super-connector", bringing together the rest of China and the rest of the world, and that, of course, includes economies along the Belt and Road. This also makes us a magnet for businesses - at last count, about 8 000 international companies have a commercial presence in Hong Kong. Hong Kong has always been a preferred venue for hosting regional headquarters or trading offices for multinational companies to manage their businesses in the Asia-Pacific. And I hereby invite more Spanish companies to come to Hong Kong and make full use of our advantages in tapping the massive Belt and Road markets. Aside from trade, logistics is another key area that has been driving Hong Kong's development as an international business centre. The Belt and Road will catalyse the movement of people and goods, boosting demand for reliable logistics services. In this, Hong Kong is also well served. Indeed, Hong Kong boasts the world's fourth busiest container port, providing some 350 services a week to more than 500 destinations worldwide. Our 700 shipping-related companies offer a wide range of services, from ship management, broking and chartering to finance, marine insurance, legal, arbitration and many other support services. Our airport has been the busiest cargo airport in the world for more than 15 years. From Hong Kong, you can reach all major Asian economies within four hours' flight time. Half the world's population is just five hours away. The Maritime Silk Road will create fresh demand for shipping services. 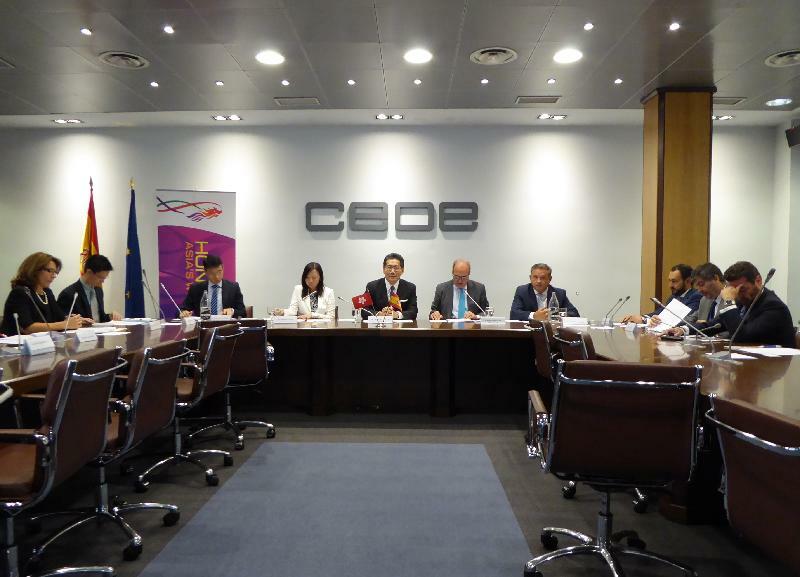 Spanish logistics companies will find it advantageous to establish a presence in Hong Kong, using our maritime services to tap into the markets of the Belt and Road. Among the Belt and Road's main goals is promoting big-ticket infrastructural development, from highways and railways to maritime and aviation transport, as well as telecommunications and energy projects. Hong Kong certainly will have a lot to offer and the expertise to share when it comes to international co-operation on infrastructural projects envisaged under the Belt and Road. Why? Because we have a deep pool of talented professionals, from engineers and surveyors to architects, designers and planners, not to mention other professionals specialised in financing, insurance, arbitration, risk management and project consulting. All of them are experienced and eager to partner with overseas businesses, including Spanish companies, to take part in the development, management and operation of infrastructural projects under the Belt and Road Initiative. Other than professional services, financial services will of course be another important area for co-operation under the Belt and Road. Hong Kong is China's international financial centre and we are also one of the leading financial centres in the world. We have the experience, the expertise and the connections to serve as the fund-raising and financial management hub for the Belt and Road. We run the world's eighth-largest stock market in terms of market capitalisation, and in 2015, we ranked first, globally, in terms of equity funds raised through initial public offerings. Ladies and gentlemen, Hong Kong has what you need in a strategic partner for the 21st century. We welcome investment and talent from Spain. In Hong Kong, you can take advantage of our low taxes, our world-class business environment and our reassuring legal system, as well as our knowledge in tapping the massive Asian markets. The Belt and Road will be built on collaborations - on deepening the bonds between nations, economies and cultures. In the rewarding future, it can offer much to the companies, and the people, of Hong Kong and Spain. My thanks to CEOE for supporting today's breakfast meeting. I look forward to welcoming our Spanish friends to Hong Kong. And I hope to visit this captivating city again soon.